With a new scam on the rise, Ideal Tax Solution is not only suiting up to protect their clients, but lending a helping hand to those who have already fallen victim. The IRS announced recently that a new tax scam has surfaced that is targeting a particular group of people and promising them a refund that they do not qualify for. The IRS announced recently that a new tax scam has surfaced that is targeting a particular group of people and promising them a refund that they do not qualify for. The scam is abusing the American Opportunity Tax Credit, which is a credit related to those who are attending college. It’s targets are all people who do not qualify for such a credit and is essentially luring them in with a promise of a refund by convincing them to claim a credit they do not qualify for. This scam, like many of the others, is following the theme of targeting people with little or no income and normally don’t have a tax filing requirement. The scam convinces them to not only file an unnecessary return, but to lie on it. Recently the IRS has stopped the heightening amount of this scam and further investigating the promoters. The catch, that is capturing many Americans, is that the scam claims the taxpayer qualifies for such a credit if they went to school years ago. This is completely untrue of the credit, but can easily trick people into falling for it. Many tax resolution companies are now able to assist those who have been scammed by giving them legal representation. Rather than dealing with the IRS oneself, the tax firm will represent you, and speak on the taxpayers’ behalf. Tax resolution companies are much more inexpensive than hiring a regular lawyer, and they have a personal relationship with the IRS. Aside from helping current victims, tax resolution companies, such as Ideal Tax Solution, utilize their Power of Attorney to interfere when their clients are being targeted for such scams. 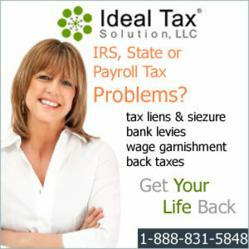 Ideal Tax Solution shared some helpful tips for these instances. Whenever an email or USPS mail item arrives that is promising money and seems unrealistic, it is! Be sure to always research the documents on the internet and many scams are viral and can easily be detected through research. About the company: Ideal Tax Solution, LLC is located in Costa Mesa, CA and provides tax negotiation services, preparation and is a collection defense specialist. Their Tax Attorneys, IRS Enrolled Agents, CPA's, Senior Tax Consultants have over 55 years of combined experience working to help American tax payers with the IRS and State Tax Agencies. Ideal Tax boasts an "A" rating with the Better Business Bureau earned through providing excellent services.